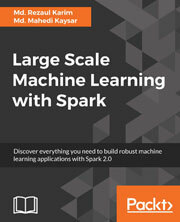 This book focuses on design engineering and scalable solutions using ML with Spark. First, you will learn how to install Spark with all new features from the latest Spark 2.0 release. Moving on, you&apos;ll explore important concepts such as advanced feature engineering with RDD and Datasets. After studying developing and deploying applications, you will see how to use external libraries with Spark.